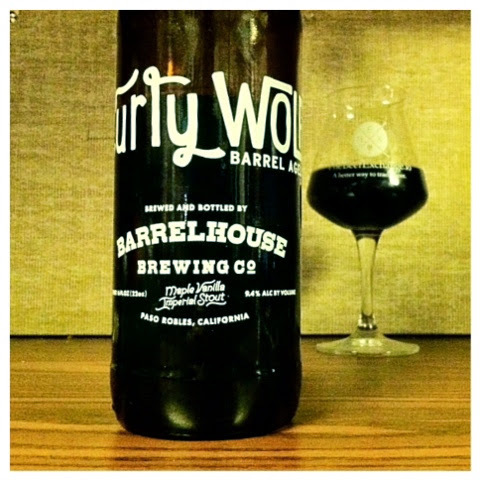 Barrelhouse Brewing Co. | Curly Wolf / Barrel aged Maple Vanilla Imperial Stout, Paso Robles, California (9.4%). "Introducing the first beer to be released in our Reservado de Robles Series. This oak barrel aged, limited release series is the canvas for our beer artists. Creamy and complex, this Russian Imperial Stout was aged in 11 year old bourbon barrels for 6 months until the time was just right. We added fresh maple to the boil and whole vanilla beans into the barrels as it aged to impart sweetness and complexity. This beer is dangerously smooth, 100% barrel aged and 100% delicious! " I hope all of you had a great and safe Halloween weekend . I am going to try a brewery not a lot of people are talking about , but are producing some great IPAs and barrel aged beers as well . This is Curly Wolf Russian Imperial Stout with maple and vanilla beans added into the bourbon barrels for extra complexity . No surprise to you guys that I love RIS and barrel aged stouts , so let's crack this bad boy open ! Also rated 92/100 on BA and an average of a 4.23 rating . Pour : Pitch black , no light coming through what so ever . I was expecting a darker head for being a RIS , but the head appears to be a mocha brown color , with a slight egg-white lacing. Also the head is dissipating quickly , fizzing like a soda almost which I don't get in an RIS pour . Aroma : Well the bourbon is present and I've smelt this type of barrel character before and not sure if it's my favorite barrel . When I reviewed the Prairie Noir variants I got this weird vanilla smell and an infected type quality . This beer doesn't smell infected , but the barrel character of smoked oak , and vanilla is the same as the barrels used in Noir and other cheaper barrel aged stouts, even though this is a $17.00 barrel , I do get a little maple , oats , vanilla , milk chocolate and powdered chocolate. . Smells alright so far , but nothing that's blowing my mind . Taste : Almost the exact same thing as the aroma . I get huge barrel character , vanilla , a little chocolate , but no way this is an RIS . To thin , and not enough chocolate notes or malt to me to be considered RIS . With this beer I wish the barrel character wasn't as dominant as it is because all I am getting is barrel , and really strong vanilla and a burn as well . Not a lot of sweetness , not a lot of maple , but I believe in barrel aged beers with maple it's going to be one of the hardest flavors to find and training the palate to get the flavor is challenging , but I think with this beer it's making it's challenge present with not just maple , but all the other flavors as well . It's good , but not what I expected at a $17.00 bottle . Verdict : 84/100 . It's just dominant over two flavors ; barrel and vanilla. I do love vanilla , but when it's completely by itself , it isn't as pleasant in my opinion . As it warms up to 60 degrees it's getting a little better with flavors , but it's still really boozy and charred like .